Convertible car hire Patalavaca Gran Canaria. We compare prices from Gran Canaria’s leading rental companies. Our philosophy is simple, the best quality at the lowest price on your car rental. Our prices on car hire always includes unlimited mileage, and all necessary taxes and insurances. 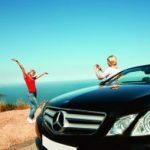 Use the search engine below for guaranteed best price on convertible car rental in Patalavaca in Gran Canaria in Spain. 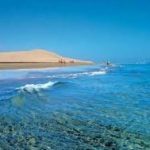 One of the places where most Norwegians overwinter on Gran Canaria, is Patalavaca located right next to Arguineguin and a short drive from the popular resort of Puerto Rico. It is not so many hotels in Patalavaca, but there are an incredible number of private apartments that are rented to sunbathers every year. The Norwegian health at Valle Marina, Gran Physical welcomes many people with various ailments, which improves very good in this climate. 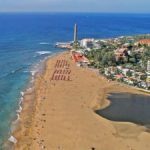 This area is considered the best in Gran Canaria when it comes to right climate. The health center is located next door to the Norwegian School of Gran Canaria, in the valley behind Anfi del Mar. 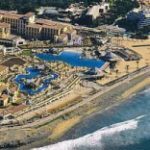 If you need car hire in Patalavaca, its easiest to order the rental car online and pick it up when land at Gran Canaria Airport. Then you easily can return the car when traveling back to your home country, and you do not need alternative transportation to and from airport. In most cases, this is less expensive than using small local car rental supplier in Patalavaca. Use the search engine above for guaranteed best price on car rental in Patalavaca. One of the better restaurants on the island are also located in Patalavaca. Cueva Pirata is almost built into the mountain behind the hotel Green Beach, with great views of the ocean. The German Valentino restaurant is also very popular, with good food that fits superbly lunch. There are also 2 small beaches in Patalavaca, with eateries and a small beach. Many also starts here when they go hiking in the mountains against the so-called Norwegian Square. Here is the path T-marked tourist association known symbol. This palm grove in the mountains was in his time a gift from Mogan municipality to all mountain hiking track Norwegians and other tourists who enjoy hiking on Gran Canaria. The former 5 star Steigenberger also located here, currently being rebuilt for the private apartments under the name La Canaria. If all permits are in order, this location will be one of the best on Gran Canaria. Good holiday Patalavaca! 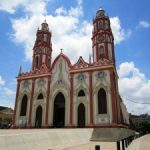 This entry was posted in Car hire Gran Canaria, Car hire Patalavaca, Patalavaca and tagged Car hire, convertible, gran canaria, Patalavaca, rental car, Spain on 2nd February 2018 by Vera.